A couple of days ago, I was going through a purse that I haven’t used since we moved and came across a menu from Primavera, a vendor at the Ferry Building Farmers Market in San Francisco. I had the best chilaquiles I’ve ever had there last year, one sunny Saturday beside the bay. Looking down at the menu in my hand, I was first overwhelmed by a wave of home-sickening nostalgia and then by a craving for something spicy, something Mexican……salsa. But I haven’t had the easiest time finding the kind of Mexican ingredients that were ubiquitous in California, like nopal and tomatillos and chiles and steamy-fresh tender corn tortillas and innumerable varieties of salsa. And then, it’s still Winter here, yes, the bare edge, but tomatoes still have the taste, fragrance, and texture of nerf balls, and I haven’t seen a fresh serrano in a grocery store in a long time. So I went back to a recipe I’ve used for years, a salsa made with canned tomatoes, one of those “Break Glass in Case of Emergency” recipes; I also grabbed a few of the serranos from our garden that we dried last year. 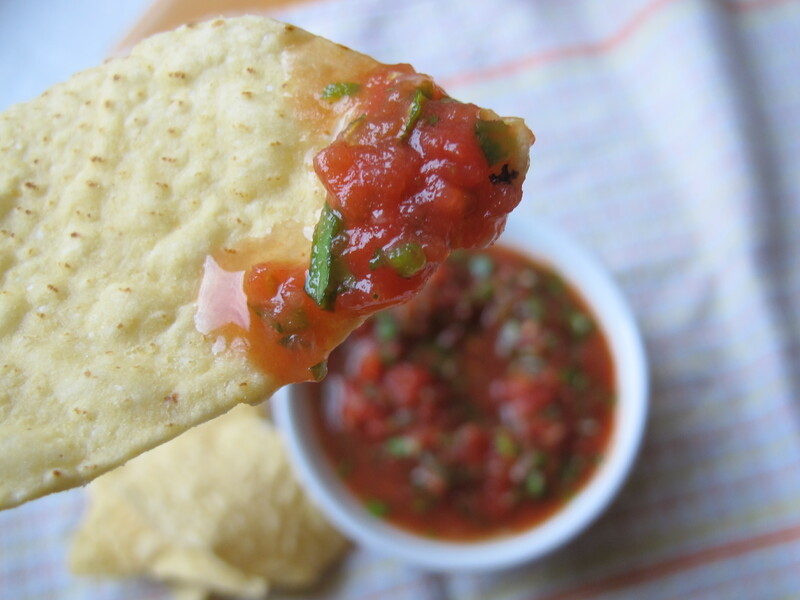 This recipe makes a bright and flavorful, respectable, craving-satisfying, fresh tasting, tortilla chip-coating salsa that also goes very nicely with pinto beans, on a taco, or can be used to gently steam/fry eggs for huevos rancheros. Blacken and blister the jalapeño, either under the broiler or over the flame of a gas stove until every inch is charred. After letting it cool down, scrape as much of the skin off as you can without going crazy, this is no time to be fussy. De-seed and finely mince the jalapeño. 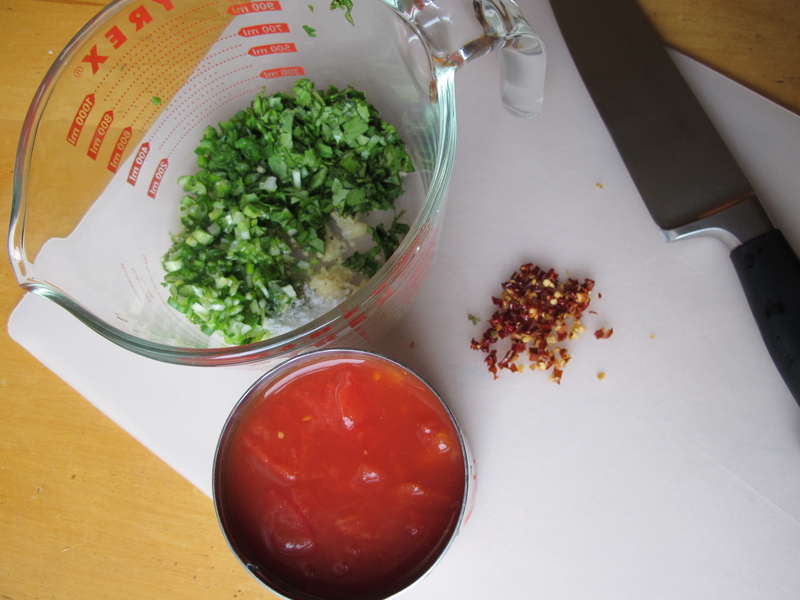 Finely mince the serranos, scallions and garlic. I use a microplane grater for the garlic, which basically renders the garlic clove a paste. If you don’t loath cilantro, coarsely chop the leaves. Once all of the ingredients are prepared, mix them with the tomato. Add the salt and Mexican oregano (which has an earthier, less minty flavor than Italian or Greek oregano). I like to crumble the leaves between my fingers before adding it- it helps the herb incorporate more easily and makes my hands smell good. Use either a blender, food processor, or immersion blender to just lightly crush the tomatoes and mix everything together well. I like a slightly chunky salsa, but blitz to your own personal preference. Although it is very respectable tasting immediately, the flavors will marry and improve with time, so try to save some for tomorrow. Nice- I like the chipotle option. I feel like the jar stuff is just to insipid and sweet, like there’s something unpronounceable in it. At least if I make it, it bites back. Cool pic of the knife and peppers. Every time I see your blog I am amazed at the quality of your photos. They are artistic as well as technically well done AND accurately descriptive of your content. Bravo kiddo. Also I want salsa now! The use with eggs is a good idea. Put it in a corn tortilla for a hot breakfast. i am from Australia and Mexican ingredients are even harder to come across! Surely this kind of recipe will suit me perfectly :). 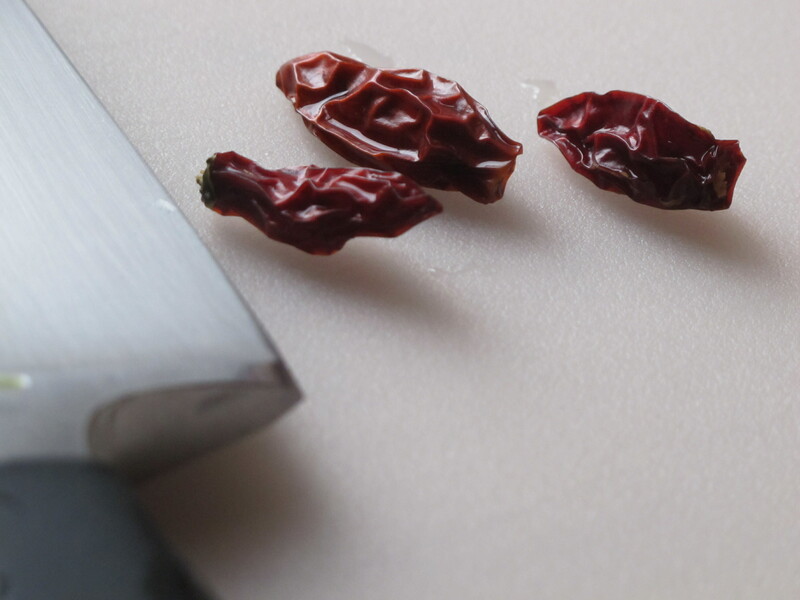 Oh, how can you dry the chilli? Just under the sun? Ahn, some chiles dry very easily, either in the sun or just spread out in a dry place. I’ve even dried some in an unlit oven; it depends on the climate and the weather. Cayenne, serrano, and poblano chiles have been the easiest for me to dry, while jalapeños, habañeros, and some “cherry bomb” peppers have better either fresh or roasted and frozen. being the wonderful chef that i am, i must ask … what in the world is a serranos? Haha, Cathey, it’s a type of pepper, smaller than a jalapeño. We grew a lot of them in our garden last year.